Similar to its sister product, the Spraybot (designed in 2004), the Coaterbot delivers a 78” wide pass with a variable height of 12-36” – while operating with a two-person crew. 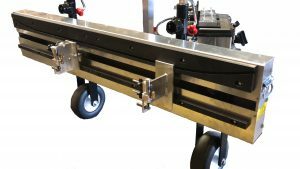 The Coaterbot was thin and thick film coatings applications in mind. The Coaterbot has the ability to apply a much broader range of materials including; foam, coatings, Polyurea, Roof CTG, Floor & Parking CTG, Primary & Secondary Containment – just to name a few. Posted in Blogs, Company News.